It’s the end of a satisfying weekend. Friday, my in-laws came to visit and watched the kids while I finally finished painting the dresser I bought off craigslist. On Saturday, my husband kept the kids busy while I moved my current dresser to my daughter’s room, her dresser to my sons’ room, and one of my sons’ dressers down to the garage to get painted. Then I had to switch all the clothes to their new locations. In the process I went through my clothes and put together a bag for Goodwill. Tonight, my husband and I managed to get the new dresser out of the garage and up the stairs to our room without hurting ourselves. It looks great in the room and the size is perfect. I just have to get new knobs for it. I paid $200 for the dresser and maybe $40 for the paint, of which plenty is leftover. New hardware will be expensive, but that is optional — I have the knobs it came with. All in all, much cheaper than what the same dresser would have been new. It’s a nice piece. I’ll post a pic when it’s all done. It rained Saturday morning, so my son’s soccer game was canceled and I didn’t feel like attempting the farmer’s market. So I went through the approximately 3,000 hoodies, coats and hats crammed onto six hooks in the family room, washed and put away some, and set aside others for Goodwill. Later, after I finished playing musical dressers, my oldest and I trekked to my parents’ house across town (I walked, he rode his bike). It took 38 minutes, so that was a nice chunk of fitness to enter into MyFitnessPal, and a lovely walk to boot. Much of it followed a path along the lake behind the high school. I love fall more and more each year, it seems. Especially early fall. Just a flush of color edging the leaves, the weather cool but not cold yet. Some kind of football game was going on in the high school stadium — not a lot of people in the stands, but they were making a lot of noise, their cheers echoing out across the lake. Saturday night, we all obsessed over a 150-piece Superman puzzle. Today, I went on a baking spree, fueled by my Wawa latte and “Brunch with the Beatles” on the radio. Instant Karma’s gonna get you! 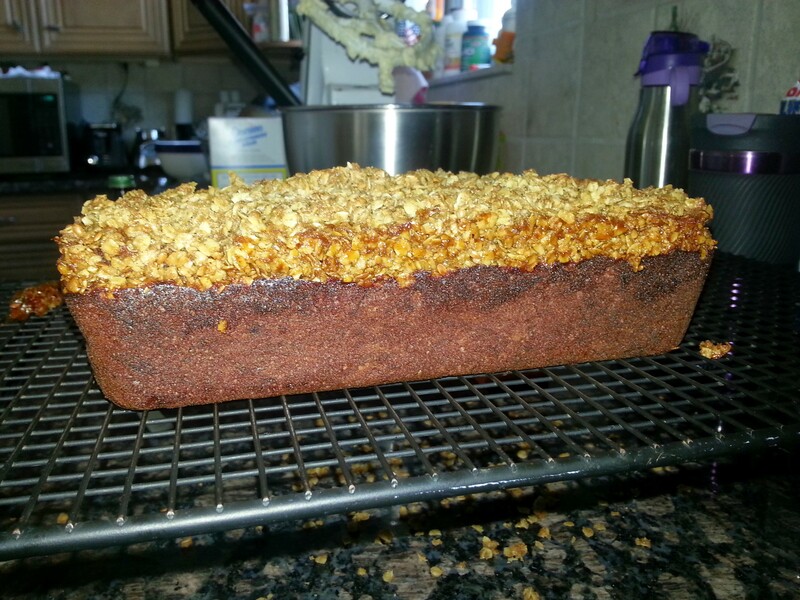 I had six frozen bananas, so I made banana bread from Jessica Seinfeld’s recipe. 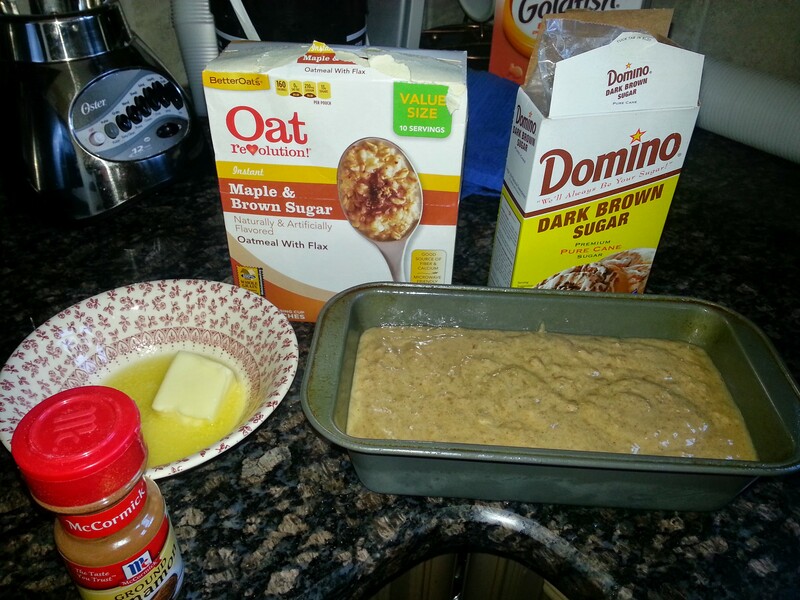 I made a streusel topping for it using some oatmeal packets my mom had given us that I know no one will eat. It smelled AWESOME while cooking. It came out a little undercooked, as it always seems to. Not sure why that is, but I still like it, and I pretty much just made it for myself anyway. 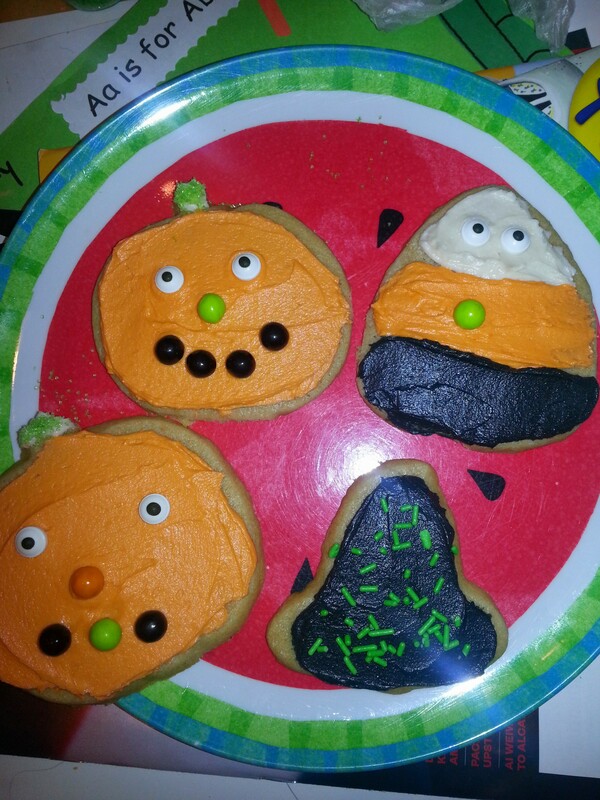 For my dear children, I made Halloween sugar cookies. I didn’t plan on making something so elaborate and not-healthy, but one thing led to another. I used Wegmans’ sugar cookie recipe. The round candies are Sixlets from Jo-Ann Fabrics, which is also where I got the cookie cutters (pumpkin, candy corn and witch’s hat). I practiced a lot of restraint in that store. Aren’t holidays crazy? 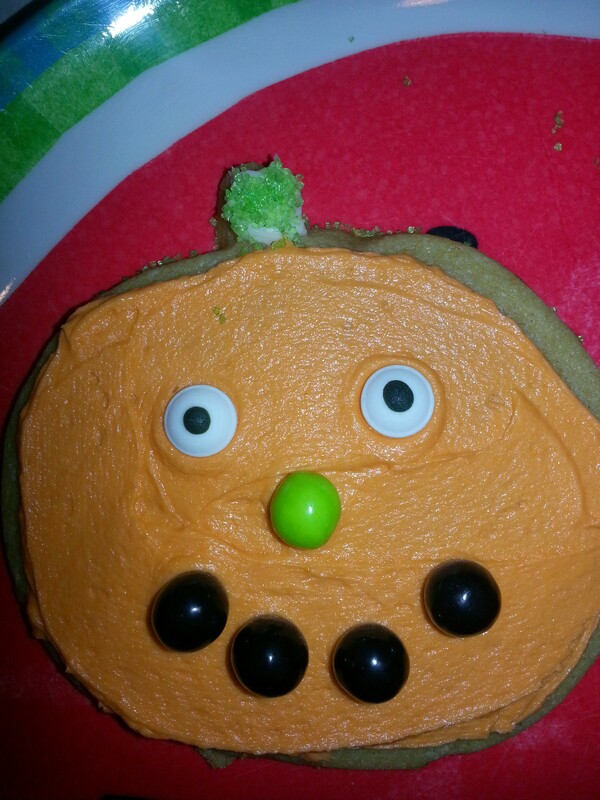 Because some Celts carved scary faces in turnips thousands of years ago to ward off bad spirits, here I am putting candy googly eyes on cookies and surreptitiously scarfing down Sixlets. Onward into another week. It’s going to be a busy one. Tomorrow I am going on my son’s pre-K field trip to the firehouse. Later in the week both boys have allergist appointments, including skin testing for my 4-year-old son. That should be pretty awesome. And somewhere in there I think my husband is going to be away a night for work purposes. But no excuses — going to keep cooking, keep exercising, keep the grocery bill down. I did some research and I’m getting closer to cutting the Verizon cord. Roku looks like a definite possibility. I’m also trying to talk my parents into letting me use a Slingbox to watch their cable. I need to talk to my friends who have gotten rid of cable and see how they did it. It’s not the TV that’s the issue for me so much as Internet. As far as I can tell, Verizon and Comcast are the only game in town for a fast Internet connection, and I don’t know if they will let you get Internet alone anymore. They are all about their stupid bundles. My blood pressure starts going up just thinking about the conversation I’ll have to have with Verizon if I want to make this happen.